Preheat the oven to 350 F. Line a muffin tray with paper liners (or butter well). Place the cornstarch, cocoa, brown sugar and water into a saucepan and whisk together constantly over medium heath until boiling and quite thick. Remove from the heat and whisk in the butter and chocolate until thoroughly combined. In a small bowl, whisk together the flour, baking powder and salt. Set aside. Add the oil, vanilla and eggs to the chocolate mixture and stir well. Fold in the sugar and continue stirring until mixture is smooth and thick. Fold in the flour mixture and stir until no clumps remain. 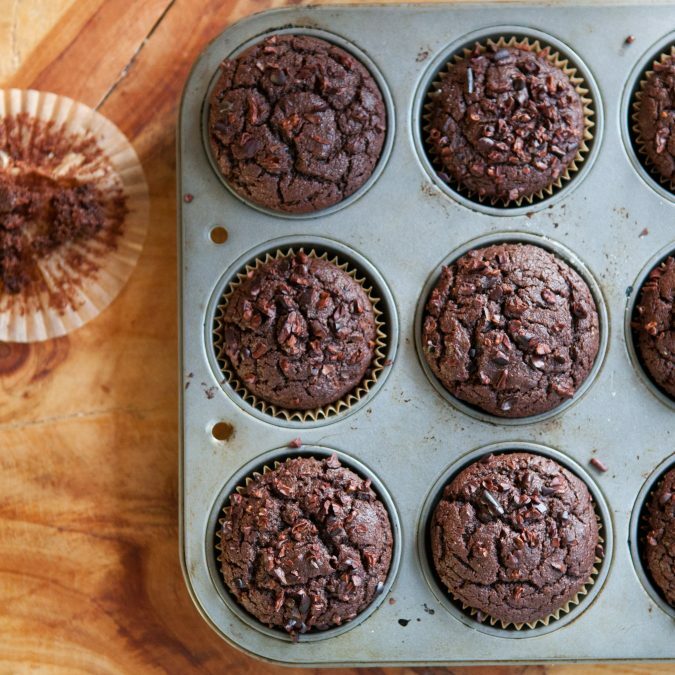 Spoon the batter into muffin liners, and sprinkle the tops with cacao nibs. Bake for 20-25 minutes, or until the tops have puffed and are dry to the touch — yet still a touch jiggly in the center . Let cool on a wire rack before serving.